This Photo from the Nokia World 2011 Party is so Full of Win! Regardless of how I personally feel about the Nokia-Windows alliance, the above photo is SO FULL OF WIN that it makes my whole day happy. On the left in the slightly rumpled-it-is-the-end-of-a-long-day suit, smiling away is Stephen Elop, the CEO of Nokia. In the center with his thumb up is everyone’s fave happy, enthusiastic blogger, Mr. Clinton Jeff. 1) How many CEO’s of Fortune 100 companies run around towards the middle or end of the yearly company conference party rather than be in the extra special VIP area? 2) How many CEO’s would pose towards the end of said party with happy, excited overly caffeinated bloggers? 3) How many humans on the planet would say to said CEO, “Hi, will take a photo with us?!?!?! ?” Clinton would. This is why we love CJ, he has got cajones. 4) Rewind 15 months ago to 4 years ago, would OPK have posed for this photo and actually looked HAPPY? No. by Ms. Jen on Fri October 28, 2011 | Permalink | moleskine to mobile. Oooh, Thanks PseudoFinn for that link to the photo of OPK and you in 2008, I quite like it. Haha thanks Jen. 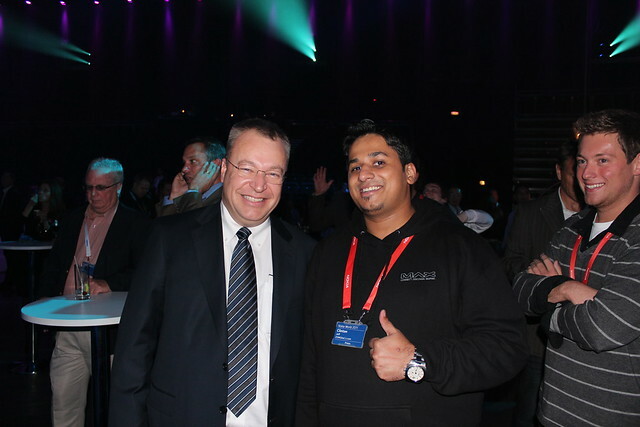 I have to say, he was really nice and was very happy to let me take that picture :o) I now <3 Elop.